I recently read several chapters in Dogs: A New Understanding of Canine Origin, Behavior and Evolution by Raymond and Lorna Coppinger. The Coppingers founded the Livestock Guarding Dog project at Hampshire College in Massachusetts in the mid 1970s. Their work helped identify the types of behaviors and experiences (or training) necessary for successful livestock guardian dogs. An incident with our own dogs last night (and observations over the last several weeks) seemed to confirm much of what I read. The book discusses the origins of livestock guardian dog breeds, which I found fascinating - the Coppingers theorize that these dogs developed over the course of centuries (indeed, millennia) of transhumant sheep and goat grazing in Europe and Asia. Dogs that stayed with these traveling flocks - and that protected them from predators - were given preferential treatment (more food, opportunities to reproduce, etc.) by their shepherds. The Coppingers also suggest that the critical period for bonding livestock guardian dogs with the animals they'll spend their lives guarding is 4 to 16 weeks of age. During this period, when a dog's brain is undergoing rapid growth and change, social bonds can be formed. After this window closes, according to the Coppingers, these social bonds cannot typically be formed - in other words, if a livestock guardian dog doesn't bond to livestock before he or she is 4 months old, it probably won't happen. 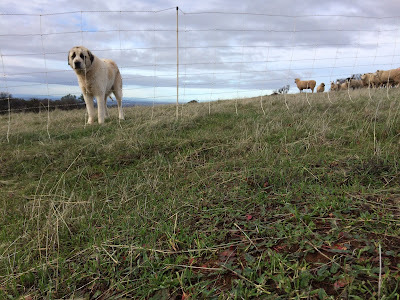 As I've written before, we require several behaviors from our working livestock guardian dogs. First and foremost, obviously, they must protect our sheep from predators - coyotes, mountain lions and domestic dogs, at the moment; wolves, perhaps, in the future. This requires the type of bonding process described in the Coppingers' book. We also need our dogs to respect our electric fences. 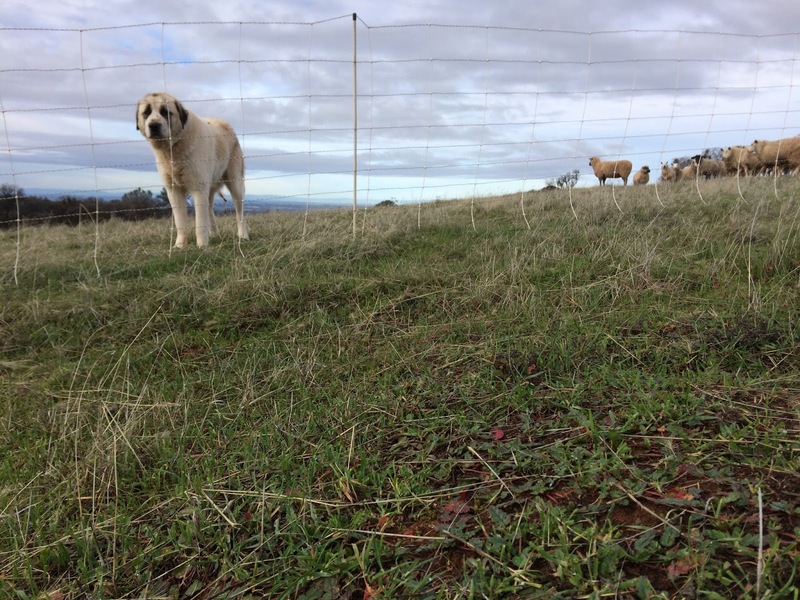 We've had dogs who were bonded with our sheep and who protected our sheep from predators, but who wanted to patrol beyond the boundaries of our electro-net fenced paddocks. Since we typically graze in rural residential areas near public roads, we couldn't keep dogs who wouldn't stay in our fences. Finally, again because we're in rural residential areas, we need dogs that are not inappropriately aggressive with other people. See "More Observations about Livestock Guardian Dogs" for more detailed descriptions of some of the dogs that have not fit our needs over the years. There are folks out there who specialize in breeding and raising livestock guardian dogs and who guarantee that they'll work in any situation. These dogs typically cost a great deal more money than the dogs we've purchased, and while they're guaranteed, I've never been willing to pay this extra cost. As I've observed our own successful dogs, I've decided that I am more comfortable managing that critical bonding window myself. I suspect that it's also important to expose a puppy to the other environmental factors that shape future behaviors in that 4-16 weeks-of-age window - factors that are very specific to our own operation. That's not to say that there's not a place for those who specialize in breeding and rearing livestock guardian puppies - these breeders are improving the genetic pool and quality of livestock guardian dogs. In some ways, I suppose, this is similar to the relationship between seedstock (or purebred) livestock breeders and commercial ranchers. All of this brings me to my recent observations. After we sheared the sheep in mid-May, we decided to put both of our dogs with the ewes and lambs. We'd kept our youngest dog, Bodie, with the rams all winter - we'd decided he wasn't quite mature enough to trust with lambing ewes. Maturity - and interaction with rams who wouldn't tolerate playful behavior - seemed to help Bodie understand his job. He's been with Reno (our older dog) and the ewes for 4 weeks now, and he seems to be doing well in his new situation. Both Bodie and Reno are well bonded with our sheep. Both of them respect a working electric fence ("working" is the key word here - more on this below). Neither of them are aggressive towards people. Last night, when I arrived at our leased pasture after work to move irrigation water, I discovered that the sheep had escaped their paddock. They were grazing on green grass adjacent to their old paddock; the dogs, on the other hand, were gone. As I started building a new paddock, I spotted Reno trotting across a neighboring field. I shook a can of dog food and called to him - he spotted me and kept going (I suspect he'd have raised a middle finger if he'd had one!). A few minutes later, Sami arrived with a border collie for me. She tried to catch him and he did the same thing to her. We decided to ignore him at that point, and I focused on building fence. A few minutes later, I spotted Bodie in the adjacent field. I called to him, which he ignored until he saw the sheep. At that point, he came back to the flock and stayed with them as I finished the fence. I suppose it took me 20-30 minutes longer to finish the new paddock. As I returned to the top of the hill where I'd parked, Reno strolled up to the new fence. Without saying anything to him, I simply opened the paddock and he walked into it. When we move sheep from one property to another, we've found that some dogs (like Bodie) will stay with the flock while the border collies are moving them. Other dogs (like Reno) will wander more widely. Reno has always returned to the flock, but we can't trust him to stay with us while we're moving. I find these differences fascinating - both Reno and Bodie are good dogs, but they're both very different. Bodie, an Anatolian x Maremma. Not going to get in a fist to cuffs with you here over some of your comments in your post which I disagree with. Will say if all you claim were true my purebred breeding operation here would not have multiple dogs I have produced over the years working on large, some very tough, hardscrabble commercial operations smack in the middle of bear, wolf and lion predator territories all over the US. One customer wrote me saying my Spanish Mastiff pups saved him over $1600 in lambs within the first few months they were on duty. That's not what I call "losing money" because you paid more for top quality dogs. But for those reading your blog (and yourself) you may want to consider reading these books below which will span all dog breeds and give you a much better foundation to grow and learn on in terms of understanding your LGDs and what makes them tick. Anyone not willing to take the time to learn how to better understand canine body language, is in my opinion, doomed to fail or repeat their same mistakes over and over again. 1. The three books - all short, easy to read and CHEAP for those of you pinching pennies - by world famous European dog behaviorist Turid Rugaas. Her books on Barking, My Dog Pulls, and Calming Signals, basically re-wrote the way people began to interact with dogs. I consider her the Tom Dorrance for dog training as her methods mirror Tom's "natural horsemanship" teachings (Tom being someone I spent time with, and also worked for many of his proteges cowboying, for many years). 2. The Truth About Wolves and Dogs by Toni Shelbourne - an eye opener, I'll leave it at that, and a hard to refute dressing down of the "alpha dog" theory, and more. 3. Canine Behavior - A Photo Illustrated Handbook by Barbara Handelman, M.Ed. CDBC. A thick book loaded with overwhelming information that will pretty much blow your mind. Finally sometime next year if all goes as planned, I hope to have my book out, Dan. I hope you'll avail yourself to it as it may show you ways to think about these dogs, and use them, that you have not tried and in doing so may contribute to your success using the. 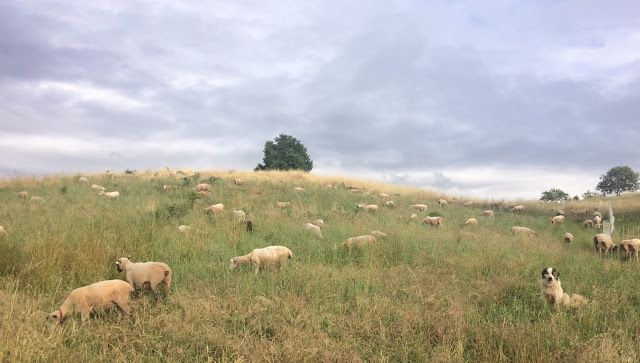 The Way of The Pack: Understanding and Living With Livestock Guardian Dogs is about 40% done and in the serious submission second stage with a renowned publisher specializing in canine related books. Keep your fingers crossed it passes muster and you can get your hands on a practical, easy to read book that will help shepherds use these wonderful dogs. A good grass year for you in CA and us here too in NV and still floating away with flood warnings on the Humboldt. No complaints. Good water = good feed. Best wishes to you for a productive summer, Dan. Definitely room for different perspectives, Brenda - and my experiences seem to be quite different from yours. I appreciate your weighing in - but would also appreciate some recognition that those of us trying to make this work in real-world settings may have different (and equally valid) approaches to using LGDs. I've always been a little fascinated by the work/play separation that these dogs have. When they work -they work. When it is time to play though, suddenly they are bursting at the seams with personality. I wouldn't worry about what you're spending on dogs, I agree with you that there are organic, environmental cues that effect their bonding & training as well. Sounds like an interesting book.